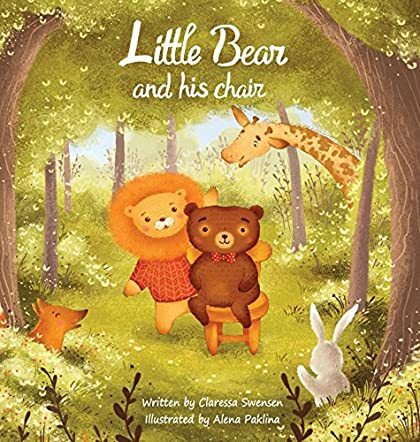 Little Bear always sits on his favorite chair when he wants to relax in the story Little Bear and His Chair by Claressa Swensen. He does not allow anyone to sit on his chair and he has warning signs so that his friends know. Ryan the lion comes walking by one day and sees the chair. He has sore feet and thinks it will be nice to sit down and rest. He ignores the warning signs and sits on Little Bear’s chair. Little Bear asks Ryan the lion to get off his chair and the lion is hurt. He goes and tells all his friends in the forest about it and they decide not to hang out with Little Bear again. Will that make Little Bear share his chair with his friends? It is a beautiful story that tells children the importance of sharing and how it actually shows their friends that they care. The illustrations are charming and they bring out the concept clearly and breathe life into the characters and scenes. The message woven into the story makes it special and a must-read so that children can understand the importance of sharing and caring. This book can be used in classrooms by tutors and educators for interactive sessions so that students learn how to share their personal things with and care for others. Stories like this are good for children to read to help them understand good messages and concepts easily and encourage them to practice good morals, values, and ethics.